In accordance with its 2017 Annual Work Plan and within the framework of Statistical Capacity Building (StatCaB) Programme, SESRIC organised the Training Course on ‘Household Surveys’ at the General Bureau of Statistics (GBS) of Republic of Suriname on 23 – 25 October 2017. The Training Course was conducted by Mr. James MUWONGE, Director of Socioeconomic Surveys at the Uganda Bureau of Statistics (UBOS), with the participation of 15 officials of the GBS. As defined in the Classification of Statistical Activities (CSA Rev. 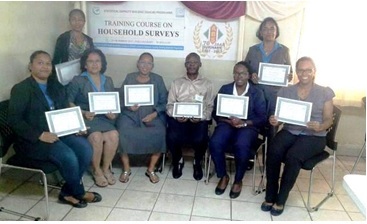 1 - October 2009; http://goo.gl/olg3Tz); Household surveys includes methodology and organization of household sample surveys including sample designs; international surveys with direct data collection from households such as Living Standard Measurement Survey or World Health Survey.